Rugby came to New Zealand in 1870. The code took off over the next two decades and the New Zealand Rugby Football Union was formed in 1892 to oversee its growth nationwide. Now known as New Zealand Rugby, the organisation administers the game at all levels throughout the country, including the management of the All Blacks, the world’s most successful rugby team. 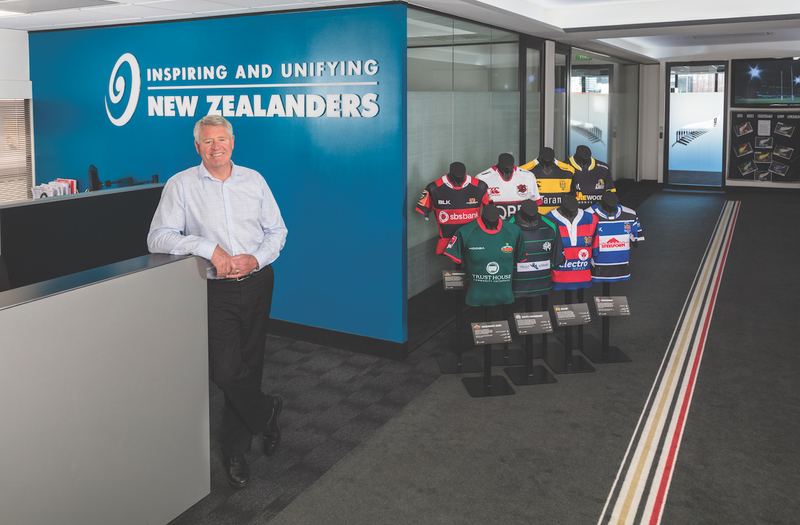 CEO Steve Tew took over the reins in in 2008, five years after joining, and was at the helm for the post-mortems that followed the All Blacks’ surprise loss to France in the quarter-finals of the 2007 Rugby World Cup. That defeat was a blow, Steve says, but the organisation bounced back quickly. In 2013, the All Blacks became the first international rugby team to finish a season unbeaten. Two years later they won an unprecedented third Rugby World Cup and in 2016 went on a record 18 match unbeaten streak. Planning is par for the course at NZR. The organisation is committed to the future and results on the field are testament to the way it follows through to achieve its goals. In 2008, the organisation secured a 20-year sponsorship deal with the German sports apparel giant Adidas. A few years later, global insurance company AIG came on board. And the organisation has just celebrated 30 years of partnership with Steinlager. “We're very committed to our long-term plans. We've just refreshed our 2016 plan for 2020 and it's very specific about what we want to achieve. Then out of that plan we draft our annual work program and our annual budgeting. If something doesn't drive results towards the targets of our plan, obviously it’s not going to make the cut,” says Steve. This strategy served NZR well when it came to bouncing back from the Global Financial Crisis. In 2008, the organisation secured a 20-year sponsorship deal with the German sports apparel giant Adidas. A few years later, global insurance company AIG came on board. And the organisation has just celebrated 30 years of partnership with Steinlager. These long-term relationships, which support amateur and professional rugby in New Zealand, have helped make the All Blacks the biggest brand in the game. Long-term strategy also served NZR well when it came to hosting the 2011 World Cup. Six years of planning went into an event that was over in six weeks, but Steve says New Zealand was judged to be a very good host.